The first of The Secret World’s seasonal events kicks off with “Samhain” The Halloween Event. The event includes 3 missions (2 Investigation, 1 Dungeon), 5 Achievements, 5 Lore, and an array of items! Below is the compiled list of information on the event! 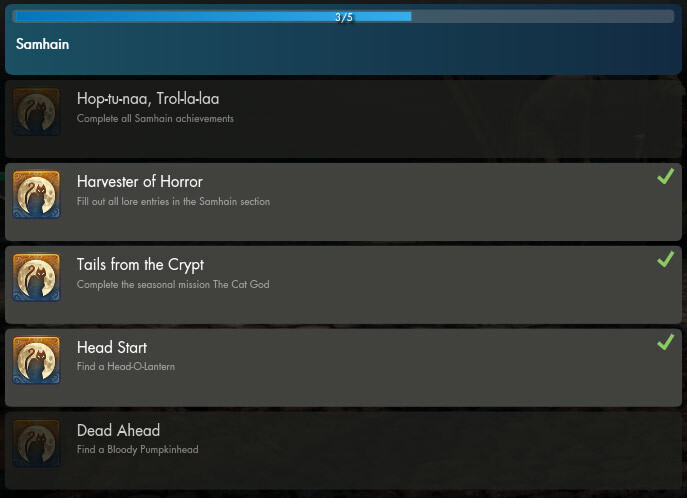 The missions for the Halloween event work as a chain, one must be completed to move on to the other. See our list of Samhain Lore Locations! The best spot we found to farm these is at coordinates (208,762), the cemetery north of the Wabanaki Trailer Park. All increase your out of combat health regeneration. Pinch of Blood – Leaves a trail of blood behind you. Lasts 20 minutes. All last for 20 minutes. Mummy, Vampire, & Zombie Emotes & Dancing! Which one is the dungeon mission? Do you really need a group for it? Or can it be done solo with purple QL10 gear? Can you describe the missions a little bit? If you two-man it, and one of you die – the guy who died can respawn and join back in the fight. With the “haunted” mobs in Blue Mountain, are they just random or condensed in areas? And are there only these mobs in blue mountain? No other zone? Random. Can be any mob in the zone. We only found them in Blue Mountain. so where is the mission start? The missions will start from a phone call when you log in, once the event is made live on the server. We’ll be posting our guides with all the details as soon as Funcom mentions when they’ll be activating the content on the live servers. The funeral Wrappings are the brown hand wraps available in Pangaea. Just a more holloween-y name for them. Good to know. I’ve not really changed my outfit since the start of the game, so I don’t frequent the clothing store too often. In order to get the Head-O-Lantern You must kill Incognito and click on his sack to receive it. I think he spawns in various locations. I found him at 175, 242 in Kingsmouth. He does appear in different locations. But, thanks for getting some coordinates for people to check. Sadly the Bloody Pumpkin Head is completely random from the “Bag of Tricks and Treats” so, depending on your level of luck… You may get one quickly! 555, 797. Found him by running around the map, keeping off the roads and sticking to wooded areas. Not sure if he can spawn on beaches, though.